You, Me and Movies: Saw Reboot? 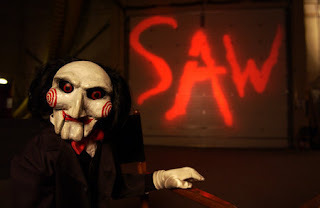 When I first laid eyes on the first "Saw" movie over a decade ago, I liked what I saw. What made the first movie so iconic was that it had tons of blood for the gore fans, but a disturbing mystery for us horror fans that love to be scared. There was a tightrope walk between the torture and the torment that I found myself enjoying this thrill ride. It had a villain we could, at the very, VERY least, sort of relate to and the big reveal at the end sent people in shock. The thing with that movie though is once the rabbit is out of the hat, its hard to duplicate. When you see one magician pull a rabbit out of the hat, the next time that magician is on stage, you expect more. We expect our magician's to push the envelope every time. The thing is, the "Saw" franchise never really did that. It was the same movie over the course of a lengthy saga, except the movies got bloodier. There was seemingly no desire to make up new mysteries or make them more disturbing or more horrifying. The filmmakers just wanted to kill people in the most mind-bending ways possible. That's not horror to me. Never was. I am disinterested in the ways people get killed but more the reasons why. "Saw" never really jumped into any of that. So it confuses me to learn that the franchise might get the old reboot. Does anybody want to be the first to tell me why? Was the "Saw" franchise so legendary that it had to be brought back this early? Was the "Saw" franchise revered as the modern "Nightmare on Elm Stree" or "Child's Play" or "Friday The 13th?" Because nobody told me if that were the case. But reviving old successful TV shows is hot on the little screen, so why wouldn't it work out for the big screen? This decision, if true, is no doubt the brainchild of somebody looking for a payday. My biggest question can they find a way to tell a great story amongst all the carnage? That will be the true test, and I can't tell if they will fail or not.